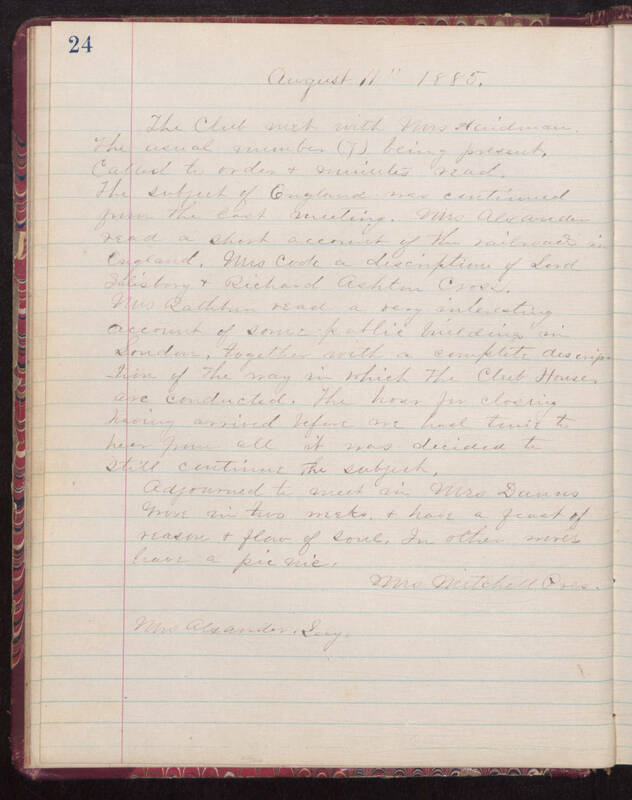 August 11th 1885 The Club met with Mrs [Acidman?]. The usual number (7) being present. Called to [under?] and minutes read. The subject of England was continued from the last meeting. Mrs. Alexander read a short account of the railroads in England, Mrs cook a description of Lord Salisburg and Richard [Ashtna?] Cross. Mrs [Rathhum?] read a very interesting account of some [je allie?] [illegible] in [London? ], together with a complete description of the way in which The Club Houses are conducted. The hour for closing having arrived before one had time to hear from all it was decided to still continue The subject, [afterward?] to meet in Mrs Dunnes [illegible] in two weeks, & have a feast of reason and flow of love, In other [words?] break a pie [wie?]. Mrs. Mitchell Pres. Mrs Alexander. [Secy? ].